Dermarolling / Microneedling / Re: Can dermarolling help with these old scars on my leg? 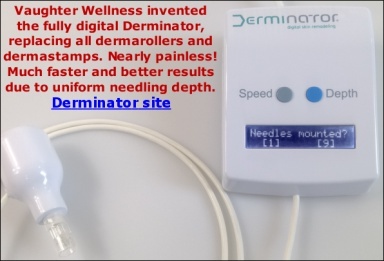 Buy a 1.5 mm dermastamp with 35 needles and use it on both of your scars. First of all thank you very much for taking time and typing a long story about your successful experience with microneedling. I was extremely happy to read about your many improvements! Personally, I have not managed to completely erase my wrinkles with microneedling but they became significantly less indented and that makes them considerably less visible. I have observed the same with my friends who use microneedling. Their wrinkles are still there but much less indented and you have to look really close to see them. You have not used the microneedling for such a long time so it is quite probable there will be further improvement. I see you are very dedicated to microneedling because your routine is quite time consuming. Your routine works and that is what is important. It is OK to roll /stamp with shorter needles in between the sessions with long needles. Yes, you can replace your 1.5 mm dermastamp with your 2 mm dermastamp, especially on the areas you have described (the forehead, cheeks). However, do not use this size around the eyes or at least do not push the needles fully in. the skin around the eyes is thinner than elsewhere. I don't think you need the single needles. In case of serious scars, it is always advisable to combine dermarolling with a 1.5 mm or a 2 mm dermastamp. You can use it during the same session with your 1.5 mm dermarollings. Skin products are helpful for optimal collagen production and healing but the microneedling itself is the most important factor to improve scars. Vit. E capsules are OK but the studies about vit. E and healing did not confirm that vit. E contributes to faster or better healing. The more is not always the better, so do not apply all products simultaneously. Alternating them is a better idea. You can keep the skin moisturized after rolling with Emu oil. Yes, apply the Retin A (without rolling). Vit. A is sensitive to sunlight, thus your skin may be depleted of vit. A as you live in a very sunny country. If your face is bleeding, you can wash it off with tap water. It is always worth trying and it is important not to give up too soon because it can take a long time to achieve improvement. Dermarolling / Microneedling / Re: Can Dermarolling fix the top layer of the skin? Dermrolling improves lost elasticity to a certain extent. In your case, use a dermaroller to improve lost elasticity and a dermastamp to crush the hardened scar tissue of your stretch marks. Immediately after stamping, apply our 0.1% Tretinoin cream. Tretinoin is not a moisturizer so apply a moisturizer on top of Tretinoin. I am really surprised scrubbing pads triggered such long-term problems with your skin. Did any of the dermatologists tell you what the suspected cause is? A bacterial or fungal infection perhaps? Long-term inflammation? Rosacea? Did they perform any tests? If antibiotics helped you, you may ask your dermatologist whether a topical antibiotic would be an option for you? You could try some topical anti-inflammatory such as ibuprofen or diclofenac gels (OTC in pharmacies) or buy NUROFEN rapid capsules or NAPROXEN capsules and pierce them. They both contain a nonsteroidal anti-inflammatory subtance. But I am not sure whether what you have is an inflammation. You can also try Tea Tree Oil (it has some anti - inflammatory and anti-bacterial properties) but you must dilute it a lot because it is an etherical oil and that can be irritating. Try it on a small part for the face to see how your skin reacts. To relieve dryness and sooth the skin, sprinkle a cotton pad with water, add almond oil and apply in your skin. In any case, dermarolling is not suitable for you and it will not help with this skin condition. Dermarolling / Microneedling / Re: Are my rolling scars tethered? All I can say in this case is that the suctioning method should be tried in cases of the rolling type of acne scars or even other scars if they have not responded to other treatments. Scars are a difficult problem and various approaches and combinations are often necessary. Some rolling scars are stretchable and their appearance does improved with manual stretching so the "stretch test" is not always helpful. Your scars are most likely not tethered but you never know. There must be some reason why they did not respond as well as the other side. You should stamp the scars about every four weeks. Everything you describe is normal. The skin is not always visibly peeling after dermarolling. When the skin turns red after demarolling, it means the intended processes were triggered. I am glad your redness is gone. Yes, you can use copper peptides every other day - I will change the sentence in the shop. Thank you for bringing it to my attention! Just do not apply copper peptides on the same day as vit. C.
Hope your rolling will go OK.
1) How long do you think I should wait before I try dermastamping? 6 months? 1 yr? Wait about three months. If it is improving by itself during those three months, wait longer. 2) Will repeatedly dermastamping eventually fill in the scar or is there a certain "limit" where the scar won't fill in anymore even with dermastamping? 3) Also, just curious why you recommend a 1mm stamp instead of 0.5mm- will 1mm be too deep for skin on my face? Scars are in the dermis and that requires long needles but a 0.5 mm stamp reaches the top of the dermis and that is likely enough in your case because your scar is shallow. 4) As for post-treatment, can I apply vaseline or do you recommend infadolin? Will not putting anything result in comparable results to if I did? You should keep the stamped skin moisturized. 5) Lastly, do you think dermastamping is the best method for me, or should I do single needling or suctioning? Single needling is also an option but you already have a dermastamp and that is comparably effective. No suctioning. I do not think this kind f scar is tethered. Mila emailed me her protocol, reproduced below. She used our single needles (previous, sold-out model) but we will get improved single needles soon, we think well before Christmas 2012. I would be glad to share my protocol. Really, from the beginning I followed the instructions totally. I am 21 years old. I have the rolling and boxcar scars on my cheeks. I also have an old surgical scar on my forehead from when I was 3 years old from an injury. My tactic is I single needle all the bigger scars (this takes some time since there are a lot) and then after that I stamp that same area 5 or 6 times. For the first 3 months I used the 1.5mm stamp, afterward but moved on to the 2mm stamp. I just use ice for numbing, but have high tolerance for pain, apparently. I noticed my skin is very tough so I push the needles in all the way and always needle very densely and from all angles. The very next day I use the suction pump on all the spots I stamped and do that everyday for 1 week, then every other day the next week. I suction to the point where the skin elevates and gets bruising but this always subsides. I also go back to using the retin a every night the very next night after stamping. I've also been taking the vitamin c orally for the past few months as I mentioned. I stamp every 5 weeks. No problems so far. Thats it! I'm not expecting perfection, but am curious to see my progress another 6 months later. I brought a pump off ebay, but it appears to have lost some 'umph.' I was planning on purchasing the one you sell, so that would be great! Thanks goes to kind hearted ones like yourself who offer practical and frank supplies, and information. It's said often but really you are the best supplier out there! And please note that we now also sell suction cups for dermaneedling. Dermarolling / Microneedling / Re: 6 month update..
We know it is not easy to regularly keep taking photographs (especially not because they all have to be sharp, high-resolution, well-lighted and from the same angle) and then to publish them online for everyone to see, so I am extremely grateful that you came forward to show your progress. Therefore, because this kind of long-term, high-quality feedback is so important to us (and to give credibility to the entire concept of dermaneedling), please email me (sarah@owndoc.com) because we think a reward is in order. We will send you some products of your choice. Would you mind if we watermarked your pictures so that unethical competitors of ours can't put them all over the internet and claim that it's from their clinic/products? It would be very interesting to get all the information on your exact "protocol" as well, so that we can learn from it and perhaps update our instructions (we're working on providing expanded guidelines and suggested schedules for product application/combination). Thank you again for this great news. >2) Will dermastamping over the area cause the healthy skin around the indented scar to change color also? I'm concerned that I will get darker skin around a bigger area if I do dermstamp over the scar. It is very rare that microneedling causes long term hyperpigmentation and it only sometimes happens in individual that are very prone to hyperpigmentations. Do a test patch somewhere on the side of your face to see how your skin reacts. Initial redness and darkish skin for several days after microneedling is normal. If you are lucky it will fill in completely but there is no guarantee. >how big will the new scar be and will it be a different color than the surrounding healthy skin? Microneedling does not cause scarring. There will be no new scar. >4) I bought a 0.5mm dermastamp, is this the right size and how many times do I stamp on my first session? A 1 mm stamp would have been a better choice but this may also work. Start slowly and when it heals OK, add more stampings in your next session. >also the removal was done 2.5 months ago, so it won't fill in if I wait longer will it? Should i go ahead with dermastamping? The indentation is almost invisible and you can start with dermastamping but in your case, you should wait longer - it may still improve by itself. >Will shaving over the area with a razor stimulate the collagen to grow and thus fill in? Maybe. The scar is very shallow, so it might. Yes, you should stretch the skin out when rolling or stamping, as recommended in our dermarolling instructions.